One of the biggest choices that face you as a mother is choosing baby diapers. They will easily cost more than any of the big purchases, like your stroller or crib. Therefore, it is worth doing some research ahead of time to see which system you want to use. The two big choices are cloth diapers or disposable diapers. Choosing to use disposable baby diapers makes a lot of sense if you are looking for convenience or do not like the idea of entering into a daily cycle of washing and drying. They truly come into their own when you are dealing with a dirty, as opposed to wet, diaper as you can just clean up the mess and throw it away. Using the cheapest diaper is not always the best option as you might find yourself spending just as much as you would on expensive brands, as you’ll be changing your baby much more often. Huggies – Huggies diapers are used by an incredibly large percentage of new mothers as they have a good reputation for high absorbency and comfort. The Huggies baby diapers for newborns come with a cutaway that will not catch on the umbilical stump. However, the technology does not come cheaply so expect to pay around 20 cents for each diaper. Luvs – Luvs diapers are a little cheaper than Huggies and are consequently a little less absorbent. However, they do their job well and are rated as being among the best in terms of not letting anything leak out. The double leg gussets offer extra comfort as well as more protection against dirty diapers. You will find them costing around 18 cents per diaper for the newborn range. Pampers – Pampers diapers have been on the market for years and are best for those looking for cheaper baby diapers in bulk. Their newborn range is branded with swaddling technology and is one the most absorbent on the market. They also come in around 17 cents per diaper and even less when you buy in bulk from your wholesale store. Cloth diapers are for parents who have time and resources to clean, wash and dry the diapers. You will also need to think about specialty diapers such as night diapers and a swim diaper. Finally, you will also need to buy the full range of diaper accessories to make changing your baby as simple and healthy as possible. On top of the day-to-day baby diapers, you will also need to think about buying some specialty diapers for specific occasions. The two main ones to think about are night diapers and swim diapers. Night diapers are designed to be bigger and more absorbent than regular diapers. You should aim to have these ready for when your baby gets to around three or four months old, which is when, they should start being able to sleep through the night. A swim diaper looks a lot like a regular diaper but has elasticized leg gussets to avoid any leakage whatsoever when you start taking your baby swimming. You can buy these as disposables or as a reusable cloth and latex mix. 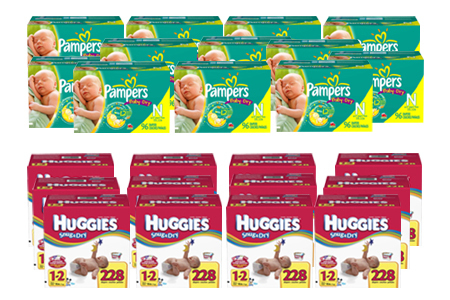 Both Huggies and Pampers offer disposable swim diaper ranges for around 40 cents per diaper. These are good small things to request at your shower in addition to baby diapers, as people will recognize the fact they are helping you in the process of becoming a mother.